You can choose any MTA you want but I have decided to keep the Debian default of Exim4. Please note that your email setup may be different and require additional configuration. For example if you use Google Apps you will need to configure authentication and SSL. I have added a couple of links at the end of this page with further information. Check your e-mail to see if this is working. 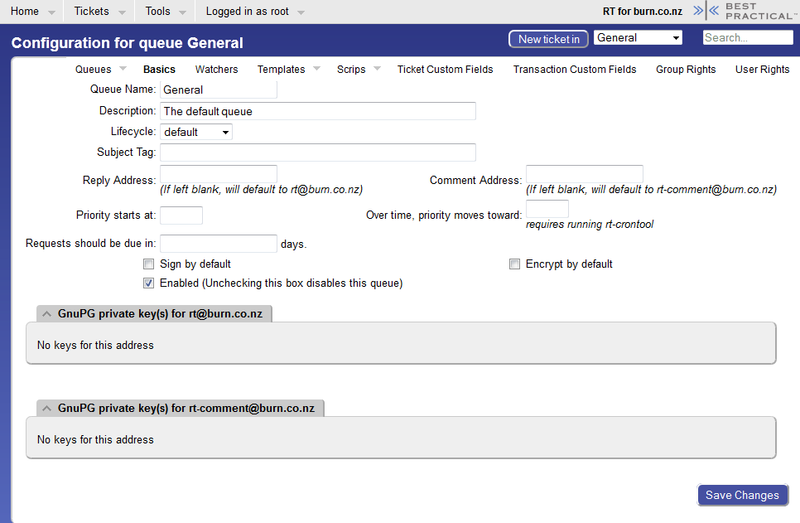 If the email doesn’t come through in a few minutes you might want to check the Exim4 configuration. 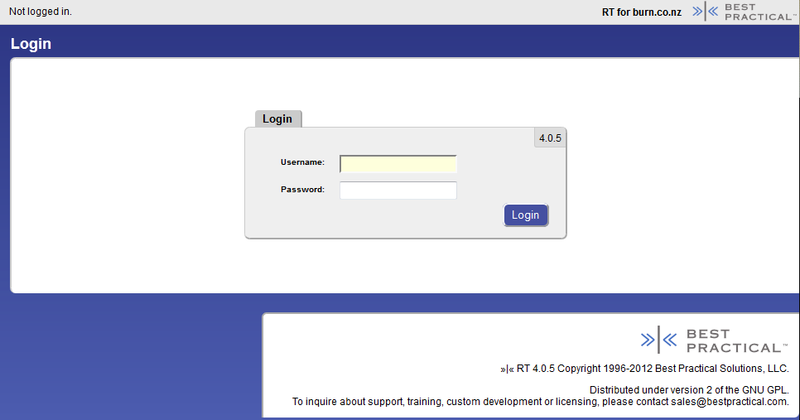 You should now be able to see the RT Web Login Screen (http://rt.example.com/rt/) and be able to login with the username “root” and the password configured during installation (note. this is the root user for RT not your system). From the home screen browse to Tools -> Configuration -> Queues -> Select. Under name click on the General queue as shown below. 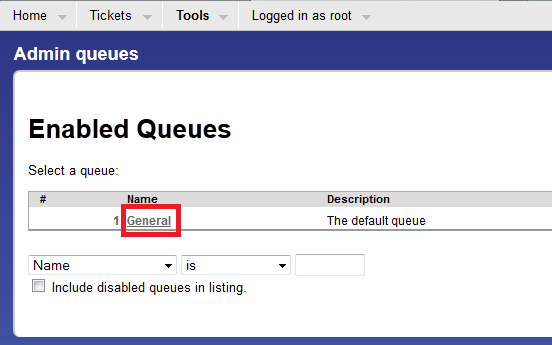 You can now edit the configuration for the queue. Change the Description as this will appear as the senders name in emails from the queue. Important: If you change the Queue Name, you need to modify the fetchmailrc (see below). and then click Save Changes. mda "/usr/bin/rt-mailgate --queue general --action correspond --url http://localhost/rt/"
mda "/usr/bin/rt-mailgate --queue general --action comment --url http://localhost/rt/"
Important: If you changed the Queue Name during RT Web Configuration, you need to modify the queue name in fetchmailrc or incoming email will not work. Restart the RT host and while you are waiting send an email to RT (eg rt@example.com) from your email account. Once the server is back fetchmail should retrieve the email within 60 seconds & forward it to RT. 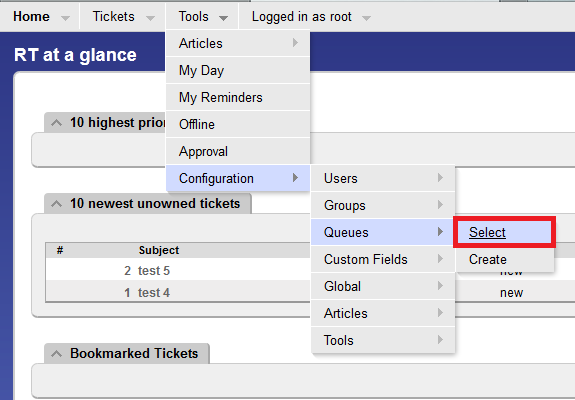 You will then get an email reply and the newly created ticket should appear in the web interface. Request Tracker should now be running and tickets can be received. You should create a group for your IT team with increased permissions to the queue, and add your team members to it. I also strongly recommend establishing a regular backup schedule for at least the RT database. Over the next few months I will try to add more RT howto’s including adding queues, integrating with an AD domain, and enabling fast full-text searching. I did like this but i got stuck in email configuration …i tested the email it’s nt sending ..is there any issue with that ..?? Hi Mike, I can try to help, or at least point you in the right direction. Did you get any error messages, either onscreen or in the logs (should be in /var/log/exim4/)? Are you connecting to an ISP SMTP server, or one inside your organization? Does it require authentication before sending? Are there restrictions on which machines can send email via SMTP? If you can’t connect at all you may have a firewall problem, or the mail server doesn’t support POP3 on port 110. Let me know how you get on, if you are still stuck we can discuss over email. Hi, I am still having problems with the mail setup, I can now create tickets in RT which will send an email back to whoever created it, I cannot however email rt and get a ticket created. Also do you have any help on getting ldap to work? Thanks. Hi Theresa, how did you get on checking your .fetchmailrc file and testing connectivity using Telnet (as above)? Look through the fetchmail logs (tail /var/log/mail.log will show the most recent mail logs) and see if there are any errors. Also keep in mind Fetchmail only runs every 60 seconds so there may be a minor delay. That sounds like you are almost there. Double check the Queue Name in RT, if you have changed it from ‘General’ to something else you will need to update the two lines in fetchmailrc with --queue general to suit (if you use spaces in the queue name use ‘ ‘ quotes around it). Let me know how you get on, and if you are still having problems we can sort it out over email. Hi Theresa, a quick fix for the immediate problem is changing the url in fetchmailrc to refer to the localhost instead of the hosts DNS name. For example use --url http://localhost/rt/ instead of http://rt.example.com/rt/. This should allow you to get emails into Request Tracker. Once you have verified that emails are going into RT you can work through any other issues. Check that your DNS server(s) have entries for the RT host, and that the RT host is using the correct DNS server(s). After that test to make sure you can ping the DNS name (eg ping rt.example.com) both from your workstation and the RT host itself. If ping can’t resolve the address there are probably still problems with DNS. After that work through any problems that show up in the Apache logs. There is plenty of information on the web; the official Apache HTTP Server docs are a good place to start. Thnk you for a really good tutorial!!! Hi Mathew, there are a number of ways to do this. Have a look through the Wiki for escalation, there are quite a few examples. The RT-Users mailing list is also a good resource. whats inside those cron files? I installed request tracker 4.2.8 with sqlite database. Now I want to use mysql. Using Debian 8 I’ve worked it out from part two on and noticed a missing command “a2enmod perl”, else apache2 does not start because of apache2-modperl2.conf in vhost conf. Trying to get this working on Debian 9. I bet I missed a step somewhere, but it will not start the web server once I add the information in the default site config file. The file that you are referring to is not in the directory. Can someone please point me in the write direction? Or, if you have a Debian 9 guide that would be amazing as well. Hi Jim, do you get any errors when you try to restart Apache? Is there anything in the Apache logs (/var/logs/apache2)?